Get your boat or RV ready for wax! McKee’s 37 Marine & RV Gloss Enhancing Final Polish is the perfect fine polish for use before final waxing. This unique formula features a select blend of ultra-fine diminishing abrasives and lubricating oils that smooth over imperfections to maximize gloss and clarity. McKee’s 37 Marine & RV Gloss Enhancing Final Polish is safe for use on paint, gel coat, and fiberglass surfaces making it ideal for use on both marine and RV applications. 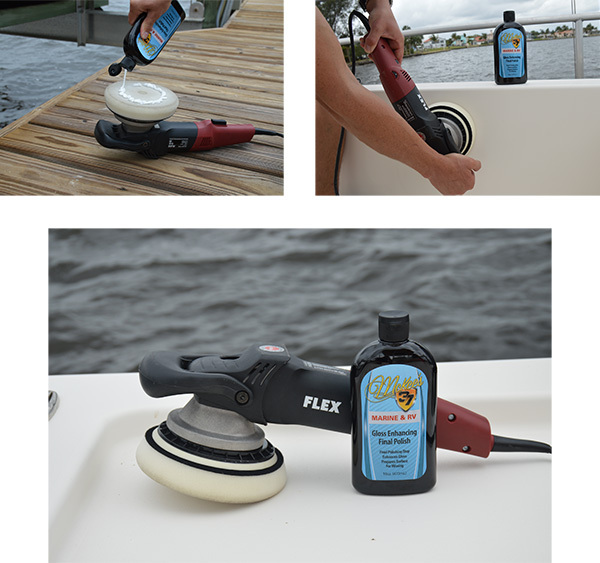 Whether your boat or RV is brand new or you just finished compounding away some severe swirls and scratches, you’re going to want to finesse the surface to prepare it for wax. McKee’s 37 Marine & RV Gloss Enhancing Final Polish is the perfect formula for enhancing clarity and creating a smooth surface that your favorite wax or sealant can properly adhere to. The diminishing abrasives in McKee’s 37 Marine & RV Gloss Enhancing Final Polish make it the perfect alternative to traditional heavy cut boat and RV compounds. McKee’s 37 Marine & RV Gloss Enhancing Final Polish is proof positive that a boat or RV can shine just like a showcar! Its fine cut abrasives coupled with nourishing polishing oils eliminate light imperfections and impart a deep gloss — before you even apply your wax or coating! For best results, apply using a machine polisher. Follow up with McKee’s 37 Carnauba Sealant Wax for long-lasting protection. Apply an X of polish directly onto a foam or wool buffing pad. Spread polish over a 2’ x 2’ area with the machine turned OFF. For a rotary polisher, set speed between 800 and 1200 RPM. For a dual action polisher, set speed between 5000 and 6000 OPM. Using a slow arm movement with medium downward pressure, perform 4-5 section passes, or until the polish turns clear. Follow with McKee’s 37 Carnauba Sealant Wax for long-lasting protection. Marine & RV Gloss Enhancing Final Polish, 128 oz.